JA: Well, my name is Julie, though I write under the name J.A. Campbell. I have a Border Collie and a horse and am owned by three cats. They keep me pretty busy when I’m not writing. I love spending time in the mountains and in nature. Triska, my horse, and Kira, my dog, enjoy it a lot too. That’s where I recharge the best. I also herd sheep with Kira and I ride a motorcycle. Never a dull moment. JA: I began telling stories and writing basically as soon as I had the concept down. My early adventures always involved killer Portuguese Men of War, though I can’t remember why. I also self-illustrated an epic tale about a bookworm. Elementary school saw many Nancy Drew style mysteries and then I branched into fantasy. Of course, I went to school and got a science degree before I came back to my first love, writing. JA: Sabaska’s Tale is an epic fantasy hiding in a contemporary fantasy skin about a modern teen who travels to other worlds on horseback and has epic adventures. She’s basically just a normal teen who inherits this crazy quest after her grandmother is killed. 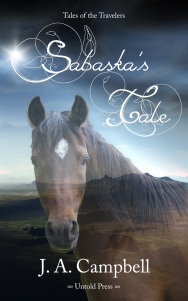 JA: My own trail riding adventures on my last horse, Sabaska, inspired the novel. When we’d go up into the mountains it would really feel like we were traveling to other worlds so I ended up writing a novel about it. JA: I have many short stories and two novel series. The Clanless series is a great teen vampire series, but my favorite is really Sabaska’s Tale and I’m busy writing more. JA: Oh, that’s a really tough one to answer. I love Brown, my ghost-hunting Border Collie. Ekatarine is one of my oldest characters, literally and figuratively. I came up with her a long time ago and she’s a vampire. She is super fun to write about and Sabaska will always hold a special place in my heart since she’s based off of my late horse of the same name. JA: The middle. It’s always the hardest. Once I get beyond the middles, the words just flow and it’s a joy to write them. The middles are tough though. JA: To tell entertaining stories that keep people coming back for more. Though, truly, I write for myself and I’m tickled that other people like my stories as much as I do. JA: I’m working on the next Traveler’s Tale novel, several short stories and a potential comic project with a friend of mine. Never a dull moment. JA: It’s a lot of work, but, as trite as the advice might be by now, write every day. And if you don’t love it, don’t do it, but if you do love it, there’s nothing better. “I’m going with you.” After a sleepless night Anna knew she couldn’t let Raymond leave without telling her more. “Anna, it’s not safe.” Raymond finished tying the cinch on Amir’s saddle. He checked his saddlebags and fiddled with the rest of the tack while he avoided looking at her. “Raymond, you can’t dangle this new world in front of me and then leave. I’m not going to simply walk away and I need someone to teach me. Besides, horses that can teleport? How cool is that? And a little revenge would be nice.” She put her hands on her hips and glared at Raymond. He finally turned and looked at her. Sabaska snorted and walked out of her open stall to stand behind Anna. Amir nudged Raymond and nickered softly. Anna looked at Sabaska. The mare nodded, laying her ears flat out to the side in dismay. “You’ve been involved since you were a kid.” Anna knew she was being stubborn, but she knew she needed to help. She couldn’t walk away now. “Cody will be here soon. Talk to your parents. We’ll leave after lunch.” Raymond heaved Amir’s saddle onto a rack and the big gray Traveler tossed his head and went through his open stall door and out into the pasture. Sabaska followed, nickering happily. Anna watched as they raced across the field together, tails flagged. They may not actually be Arabian horses, but they sure looked like it. Anna and Raymond closed the stall doors so the normal horses couldn’t get into the barn. Several of the horses whinnied and the horses found their stalls as Cody’s truck rumbled down the driveway. “Guess we’ll find out.” Anna’s stomach twisted nervously. Anna nodded, swallowing a lump in her throat. Raymond followed Anna down the aisle and they waited in the shade for Cody to join them. “Anna!” Cody said when he saw them. “Cody, how are you?” Raymond said. “I’m fine. Sorry about Sherrie.” Though his words were simple, Anna could hear the genuine grief behind them. Anna and Cody stayed silent while he walked down to the end of the barn “So, what do you know?” Anna knew the question wasn’t very clear, but she didn’t know what else to say. “Seems you’re tangled up in it now, too. Dangerous.” He glanced at the ground and sounded concerned. Cody ducked his head, hiding his expression behind his hat brim, but Anna thought she caught a hint of a smile.